As part of the Winterval Waterford Christmas Festival and in conjunction with the annual Waterford Crafts Christmas Craft Fair in the Garter Lane Arts Centre, Waterford Crafts and the Garter Lane Arts Centre are excited to announce new craft events for 2017! Learn how to create your own beautiful decorations, cards and gifts for Christmas at our Waterford Crafts Workshops. 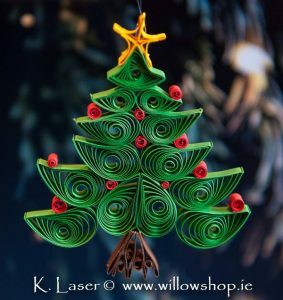 The first of our craft workshops is a Festive Quilling Workshop with artist Karolina Laser on Wednesday 29th November at 7 pm. Karolina has been a Waterford Crafts member for a few years and creates beautiful cards, decorations and framed gifts using paper and the quilling technique. Quilling is a very unique, effective and rewarding paper art. With only basic skills, Karolina will demonstrate how to create unforgettable greeting cards, pictures and accessories that will be cherished for years to come. This workshop is an introduction to quilling covering basic techniques using the slot tools and all materials and tools will be provided. Places are €12 pp and can be booked on the Garter Lane website here . For more information on Karolina and her crafts, go to www.willowshop.ie. The second of our craft workshops is a Festive Willow Workshop with basket weaver Cathy Hayden on Wednesday 6th December at 7 pm. Learn how to create your own Christmas decoration or a wreath using willow and all materials will be provided. 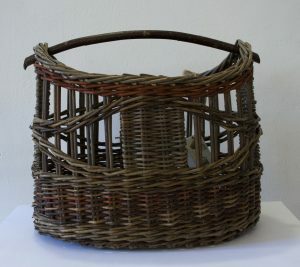 Cathy started basket weaving at night classes in Dublin in the early 80’s and went on to do a year’s full time training with Joe Shanahan in Carrick-on-Suir, who was the last in a long family line of traditional basket weavers. She has been a Waterford Crafts member for nearly 30 years. 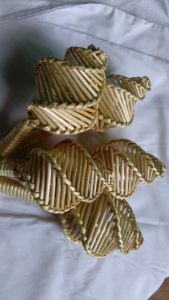 From her studio in Drumcannon in Tramore, Cathy runs basketry workshops for beginners and grows her own willow for all her baskets. In 2015, Cathy featured as a mentor in the RTE Craft Master show and mentored three craft makers. Places are €15 pp and can be booked here . For more information you can check out Cathy’s Facebook page here. The third of our craft workshops is Festive Card Making Workshop with Sharon Fleming on Wednesday 13th December at 7 pm. Sharon is a Waterford based ceramic artist and a Waterford Crafts member for many years. Her work is inspired by nature as well as patterns and textures found in everyday surroundings. For her Waterford Crafts workshop she will give an introduction to screen printing with different techniques to creating cards and designs that can be framed as unique gifts. Spaces are limited. Places cost €12.50 pp and can be booked here. All materials will be provided. Sharon also runs ceramic workshops and can be contacted at www.sharonflemingceramics.com for more information. Places for all three workshops are very limited so early booking is advised. See below for full details on how you can learn to create your personalised gifts this Christmas. The Waterford Crafts annual Christmas Craft Fair will open it’s doors in the Garter Lane Arts Centre on O’Connell Street, Waterford, on Tuesday 28th November and open everyday up to the 23rd of December. 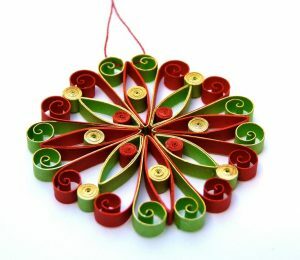 Explore quilling techniques with Karolina Laser- use of strips of paper that are rolled, shaped, and glued together to create festive designs! Learn how to weave your own Christmas decorations and wreaths using willow and other festive materials with local craftsperson Cathy Hayden. Make your own Christmas-themed monoprints with Garter Lane studio artist, Sharon Fleming. 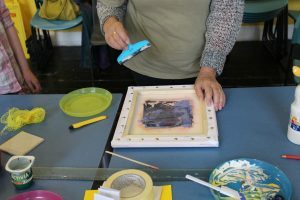 In this workshop, you will be introduced to screen printing and use stencilling and impressing techniques to make your own unique cards, labels and pictures ready for framing. The process is very loose, creative and fun. Beginners welcome.